Smaller in size, but no less versatile, Easy-Close Mini Cuffs have half the level of buoyancy and resistance of our HYDRO-FIT Cuffs. Easy-Close Mini Cuffs feature our convenient and simple to adjust Velcro-like fastening system. In shallow or deep water, wearing Mini Cuffs increases the water's resistance, helping you improve muscle tone and aerobic endurance. Mini Cuffs are designed to fit around your ankles, around your arms, on your wrists, even around your waist. When worn as a belt, Mini Cuffs will fit up to a 38" waist. Available in Blue/Black color combination. Sold in pairs. Proudly Made In the USA. Water exercise is all about moving more water and creating more resistance—an irresistible combination for a great workout. Get more from your workouts with the most versatile water exercise products we make! HYDRO-FIT Cuffs and Mini Cuffs adapt to a wide range of water workouts—from shallow to deep water, from very intense to more moderate and relaxed—and function as four different pieces of water exercise equipment, all in one! 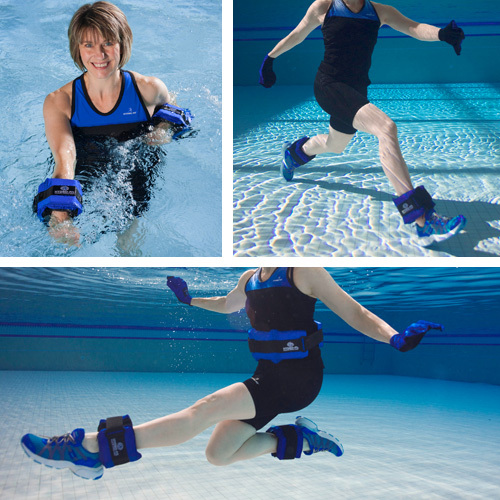 Ankle Cuffs: Underwater, Mini Cuffs work like ankle weights on land, toning and strengthening all the major muscles in your lower body. Buoyancy Belt: Fasten your Mini Cuffs together to create a comfortable and secure buoyancy belt for deep water exercise and water running. Mini Cuffs' segmented design distributes buoyancy evenly around your torso and fits waists up to 38". Because Mini Cuffs provide only half the level of buoyant support in deep water as HYDRO-FIT Cuffs, it is necessary to wear two pairs, one pair around your ankles and one pair around your waist. Wrist Cuffs: On your wrists, MIni Cuffs provide the resistance and buoyancy of buoyant barbells to tone and strengthen all the major muscles in your upper body. Our Cuffs hold onto you, you don’t have to hold onto them—less grip, more stability, and secure comfort. Arm Cuffs: Around your upper arms, Mini Cuffs give you buoyant support in deep or shallow water. Ideal for abdominal toning exercises and deep water activities where a buoyancy belt is not suitable. This challenging shallow water exercise develops core strength, balance and coordination. Engage your abdominal muscles as you lift and swing one leg forward and up. At the same time press both arms down and back.